Letterpress printing is a relief printing process, which initially utilized raised metal type and engravings to imprint words and designs on a page. Letterpress originated in the 1400s and was the primary form of printing and communication for more than 500 years. For centuries it was the primary method of publishing books, but over time it has evolved into an art form more than a standard printing practice. Now, letterpress printing allows modern printers to create commercial works that have an appealing tactile quality in comparison to current offset and digital printing methods. When Johann Gutenberg invented the printing press in the 15th century, his goal was to bring books to the common people. In the decades just preceding the 1440s, printing of any kind required craftsmen to carve entire pages of text into wooden blocks. Once the text was carved, the space around the letters had to be whittled away so the text was the only surface that would touch the page. The blocks would then be inked and paper placed on top, and rubbing the paper onto the wood would create an impression. Each page required its own wooden block, which was a time-consuming and difficult process. However, wood-block printing did allow books to be copied more easily than the earlier method of transcribing by hand. Gutenberg’s efforts to create an easier way of printing took an extensive amount of time and funding. It is believed that his first forays, between the 1430s and 1440s, were through his own version of wood-block printing, with individual, reusable letters carved into wood blocks instead of entire words or pages. This allowed for a movable type, where individual letters could be used to form words for one page of print, then taken apart and re-ordered to create the next. While this method was a significant improvement on wood-block page printing, the wooden letters did not print with clarity, so Gutenberg began working with metal type instead. The metal type included individual capital and lowercase letters, as well as punctuation symbols; these characters’ reverse impressions (or “mirror images”) were cast in steel. Letters and symbols could then be assembled on a wooden forme to create entire pages of text, complete with spacers and lead rules for legibility. In order to transfer these impressions from forme to page, Gutenberg used a lacquer-like ink he created himself out of soot, walnut oil and turpentine. Gutenberg’s printing press was called a “screw press” or handpress, and allowed ink to transfer evenly between the page and the forme. With this new way to print, Gutenberg could print books at a rate of approximately six pages per day. His most notable print job was a copy of the Bible, which was 42 lines of text in two columns on each page, and consisted of two volumes that totaled 1,282 pages — a task that took a staff of 20 and two to three years (between 1452 and 1454/1455) to complete. One hundred eighty copies were made of this Bible, and 48 copies can still be found in museums today. For the next 350 years, Gutenberg’s press was used to print with virtually no changes to the design. While the printing press itself changed very little over the next few centuries, the ability to print more quickly and efficiently gave rise to new ways of thinking. The publication of the Gutenberg Bible not only allowed the printed word to reach the common people, it also encouraged the spreading of information and ideas. The first English book was printed in 1473 in Bruges, Belgium, by William Caxton. His printing press and subsequent standardization of the English language are said to be the reason for the expansion of English vocabulary and introduction of inflection in writing. Typeface designer and gunsmith William Caslon created a type that was legible and distinct, which became popular for use in printing important documents. After his death, Caslon’s typeface was used in the printing of the United States Declaration of Independence in 1776, which was sent out to all the states. Individuals continued to find ways to improve the look of the printed page over the decades. In the 18th century, printer and typographer John Baskerville created a way to make paper whiter and smoother so that in printing, the ink showed up strong and crisp. He also was the pioneer for adding wide margins to the printed page, as well as spacing — or leading — between lines of text. In 1798, Alois Senefelder invented lithography printing. Unlike with letterpress, lithography printing allows the entire printing space — both the text to be printed and the white space surrounding it — to remain on a level surface with no raised areas. Lithography was less expensive than letterpress printing, due to the availability of cheaper paper options and that, driven by steam power, these presses could print large quantities of pages more quickly than with letterpress. Printers immediately attempted to print color images with these new lithographic presses, as multiple litho plates could be used one after another on the same page. 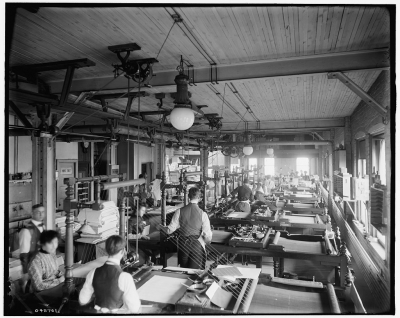 Within 100 years, lithography was the primary method for advertising and magazine printing. However, lithography did not completely remove the need for letterpress printing in the 1800s. The Industrial Revolution brought improvements to the design of the hand press, including improved leverage and weighting to get the correct amount of pressure put on the form each time. In the mid-1880s, a high-end tabletop platen (press) was invented that left a clear impression on each page, thanks to a side arm whose length provided better leverage. By the end of the century, a smaller, “low-end” tabletop press had been developed as well for use in smaller print shops. While previously full-sized presses had to be operated by foot while paper was hand-fed to the press, they were updated to include individual motors. Later, automatic feed presses were introduced that were not only motorized, but independently fed paper; these presses could print up to 5000 copies in an hour with little to no attention required. Despite these updates, there were still issues when printing with a letterpress. When printing magazines or newspapers, each page’s ink took time to dry, and if assembled too quickly, the ink would smudge. In 1939, Walter Huber filed for a patent for his ink that dried solidly and instantly upon contact with paper, due to fluctuations in the ink’s temperature. This solid ink was resistant to smudging and allowed for cleaner, sharper printing than previous letterpress inks. These improvements allowed the letterpress to remain relevant throughout the first half of the 20th century, despite the growing popularity of lithography and later, offset printing. 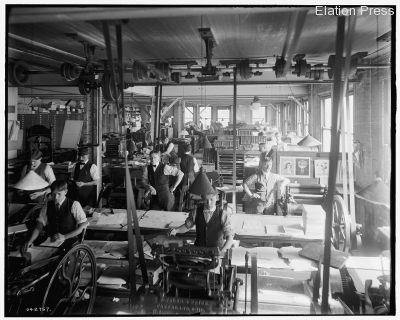 Offset printing came about by accident in 1903. American printer Ira Washington Rubel owned a lithograph press, and when he failed to insert paper, the stone plate’s image transferred onto the rubber cylinder used to make the impression. After putting paper back in the machine, the stone printed on one side of the page while the rubber cylinder printed on the other. Rubel was surprised to find that the image from the cylinder was significantly sharper than the image from the stone litho plate. Later, he invented a machine that re-created his “accident.” However, it wasn’t for another few decades that offset printing began to gather momentum. Compared to lithograph presses, which utilized stone plates, offset printing was imprinted from rubber, and the image could be transferred onto not only paper, but other surfaces such as wood and metal for versatility. Within 50 years of lithography’s rise, offset lithography and digital printing had taken over the scene. By the 1950s, offset printing was the most popular method of commercial printing. With the rise of computers came the downfall of letterpress printing. Everything could now be accomplished through digital or offset printing, either through a print shop or out of one’s own home. Most commercial printers utilized digital offset printing, which places the ink directly on the surface of the page and cannot imprint the page the way modern letterpress does. In the late 1980s, letterpress printing had its own revival among small printers who still wanted that tactile, quality feel that offset printing cannot provide. However, it wasn’t until the 1990s that it became popular among individuals for their personal printing needs. It was around this time when Martha Stewart Weddings featured letterpress wedding invitations, sparking a renewed interest in the printing method. Original letterpress printers used a “kiss” method of printing; that is, the press only touched the paper enough to transfer the ink. Modern letterpress enthusiasts, however, are interested in deep impressions in the page — more commonly referred to in the industry as “debossing” — which make it immediately obvious that the page is, in fact, letterpress and not printed by any other means. The appeal lies in the deep impressions on the page, as a beautiful, imprinted work of art rather than just a printed page. This elegant, tactile quality of current letterpress printing is now the primary reason for choosing to print with this method rather than offset. As offset is now the primary printing method for both professional and home print jobs, letterpress printing takes the recipient back to a time when printing was a craft that took time to create. It’s now about the look and feel of the paper, and quality is key. While some printers still utilize Gutenberg’s method of individual characters to print letterpress, others have embraced digital methods that make the process simpler. With computers, designers are able to use software to combine the text and designs to be printed. They can then produce a digital page and create a photopolymer plate of the page’s design. The design can then be pressed into the paper, creating a colorful, tactile work of art. Now, letterpress printing is used for all kinds of work. The most popular option is letterpress wedding invitations, which can be as simple as a single invitation card or as complex as an entire letterpress suite, complete with reply cards, intricate and detailed maps, and envelopes pressed with unifying design elements. In addition, couples are now sending letterpress save-the-dates prior to their weddings, as well as featuring letterpress throughout their big day in the form of programs, place cards, beverage coasters, menus and even thank-you cards once the celebration is over. Weddings aren’t the only big events that are letterpress-worthy. Bar and bat mitzvah invitations, birth announcements and shower invitations have also appeared, as have letterpress greeting and holiday cards. Gift tags can be imprinted and used for holidays and birthdays, and more people are using letterpress stationery in correspondence, combining two old art forms: typesetting and hand-written cards. Outside of personal use, businesses have embraced letterpress to print business cards and event promotion posters, and have even had QR codes imprinted onto their advertisements that take the viewer to the company’s website. The letterpress technique can even still be used to print books, despite the hefty price tag. The finished product is high quality, demands to be touched and brings a sense of class to the business that offset printing could not accomplish. Banasky, Jon. The Letterpress Revival. FLUX Magazine. 3 May 2010. Web. Accessed 19 June 2012. Bryan, Lorrie. Chucks, Ducks and Letterpress. The Canvas Magazine. 17 Feb 2012. Web. Accessed 19 June 2012. Elizabeth and Eric. Briar Press Museum. 1995-2012. Web. Accessed 18 June 2012. History of Printing. British Printing Society. 2012. Web. Accessed 18 June 2012. Holson, Laura M. Retro Printers, Grounding the LaserJet. The New York Times. 10 Dec 2006. Web. Accessed 19 June 2012. Huber, Walter, et al. Process of Letterpress Printing. U.S. Patent Number 2268594. 3 Aug 1939. Web. Accessed 18 June 2012. Johann Gutenberg | Biography. Encyclopedia of World Biography. 2012. Bookrags.com. Web. Accessed 18 June 2012. Letterpress Printing. British Printing Society. 2012. Web. Accessed 18 June 2012. Rose, David S. Introduction to Letterpress Printing. Five Roses Press. 2005. Web. Accessed 18 June 2012. Saltzman, Marc. LetterMpress: A vintage letterpress app for iPad. USA Today. 22 July 2011. Short History of Offset Printing. Old Tyme Offset Printing.com. Web. Accessed 18 June 2012. Spark Party Papers. Spark Print Solutions at Spark Letterpress Love. Web. Accessed 29 June 2012. Special Collections. Printing in the Nineteenth Century. University of Delaware Library. 21 Dec. 2010. Web. Accessed 18 June 2012. The Printing Industry in 1965. British Letterpress. 2012. Web. Accessed 18 June 2012. Why Letterpress? Rainy Planet Press. Web. Accessed 18 June 2012.